Finding the perfect wedding dress can become a quest. After all, all eyes will be upon you that day, and you'll be included in hundreds of photos that will be posted socially and kept forever. It can make it feel like a daunting choice, and therefore it's not surprising that women take their time to get it right. POPSUGAR Insights recently surveyed over 1,200 married or engaged POPSUGAR readers to learn how they decided on the perfect dress for their big day. Overall, 71% of women visited between one and three different dress boutiques, with 22% visiting between four and six boutiques. Over one-third of women tried on between four and seven dresses, with 45% of women trying on seven or more dresses before making their final choice. Over six in 10 women spent less than $1,000 on the dress they chose (61%), and 27% of women spent between $2,000 to $3,000 on the dress. 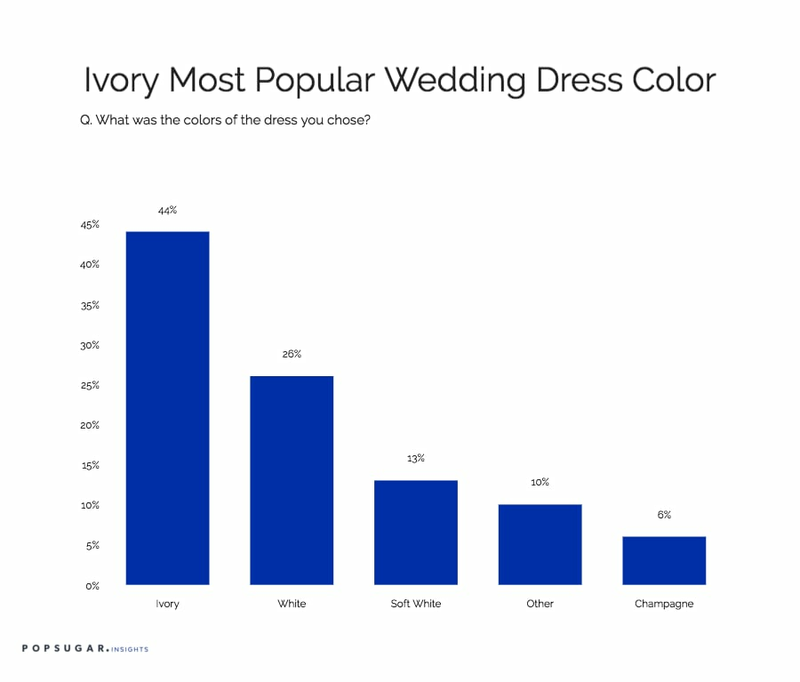 The most popular dress style was A-line, with 33% of brides choosing that style, and ivory was the color of choice for most brides (44%), followed by white (26%), soft white (13%), and champagne (6%). In order to ensure they looked their best for their big event, 55% of women say they went on a diet prior to their wedding. Ninety-one percent of women said they skipped hiring a personal trainer or nutritionist and got in shape by themselves, while 6% hired either a personal trainer or fitness instructor, 1% hired a nutritionist, and 2% hired both.